Israeli forces continued with systematic crimes in the occupied Palestinian territory (oPt) for the week of 19 – 25 April 2018. Israeli forces continued to directly target peaceful protests that did not pose any threat to the Israeli soldiers’ life. 5 Palestinian civilians were killed, including a child and 2 civilians, succumbed to their wounds; one of them is a journalist and the other was profoundly deaf. 288 Palestinian civilians, including 52 children, 7 women, 2 journalists and 2 paramedics, were wounded in the Gaza Strip.12 Palestinian civilians, including a child and elderly, were wounded in the West Bank. Israeli violations of international law and international humanitarian law in the oPt continued during the reporting period (19 -25 April 2018). Israeli forces continued to use excessive lethal force against Palestinian civilians, who participated in peaceful demonstrations organized on the 42nd anniversary of the Earth Day, particularly in the Gaza Strip, which witnessed peaceful demonstrations along the eastern Gaza Strip border area, where ten thousands of defenseless Palestinian young men, women, children, and elderlies participated. On 20 April 2018, the Gaza Strip witnessed peaceful demonstrations where ten thousands of Palestinian civilians participated. Those non-violent demonstrations continued sporadically during the reporting period. As a result, 5 Palestinian civilians were killed and two others succumbed to their wounds; one of them was a journalist and the other was profoundly deaf. Thus, the death toll has increased to 36 Palestinian civilians, including 4 children and 2 journalists, since the beginning of the demonstrations in the Gaza Strip only on 30 March 2018. Moreover, during the reporting period, 288 Palestinian civilians, including 6527 children, 107 women, 2 journalists and 2 paramedics were wounded; 15 of them sustained serious wounds. In the West Bank, the Israeli forces wounded 1127 Palestinian civilians, including a child and elderly, in separate incidents. The Return March encampments were relocated 50-100 meters closer to the border fence and surrounded with sand barriers. The Israeli Forces increased the height of the hills on which the Israeli snipers position so they would have a clear view of the area while dozen snipers continued to position behind the sand barriers, hills and military jeeps along the border fence in the eastern Gaza Strip. In the morning, the Israeli warplanes dropped thousands of leaflets near the protest sit-ins, warning the residents of being targeted if approaching or attempting to damage the border fence. Those leaflets were preceded by Israeli military and political officials’ statements which threatened to inflict casualties among the protesters and considered that the March itself poses a danger in violation of the right to peaceful assembly ensured in all international conventions. The Israeli snipers deliberately and selectively opened fire at the participants in the peaceful demonstrations which included thousands of civilians in 5 areas in the eastern Gaza Strip. 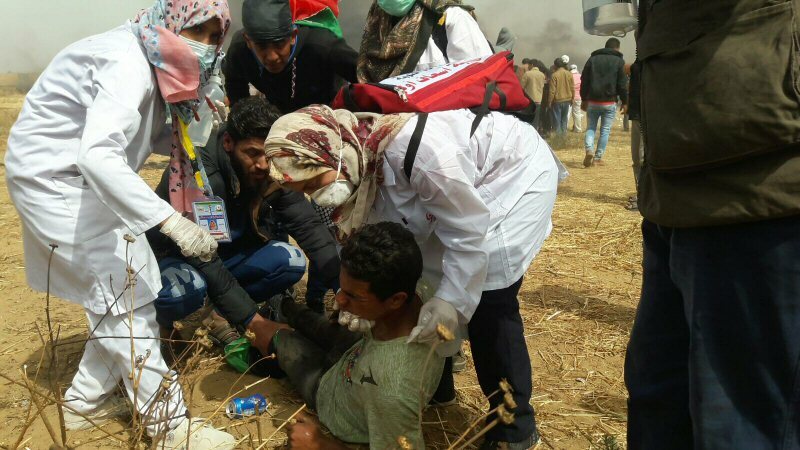 As a result, 4 civilians, including a child, were killed and 274 others were wounded on the fourth Friday of the March of Return and Breaking Siege and one of those seriously wounded succumbed to his wounds 2 days after his injury, noting that most injuries occur in the demonstration area which is around 50-300 meters away from the border fence. The demonstrations were as always fully peaceful, and PCHR’s fieldworkers did not witness weapons or armed persons even dressed in civilian clothes among the demonstrators, who were thousands of elderlies, women, children and entire families. Those demonstrators who moved up to 100 meters closer to the border fence raising flags, chanting slogans and national songs and flying kites in high numbers. The demonstrators also set fire to tires while in other demonstrations there were folklore and sports performances in addition to women’s gatherings. However, the demonstrators were under the Israeli fire. The Israeli forces widely used bursts of tear gas canisters targeting the center of the demonstrations and beyond away from the demonstrators near the border fence. As a result, hundreds, including PCHR’s fieldworkers who were documenting the incidents, suffered tear gas inhalation and seizures ; some of them were transferred to hospitals as a number of them still receive medical treatment. For the second week in a row, the Israeli forces fired tear gas canisters which fell on the field clinic and medical center belonging to al-Barakah Algerian Association in Khuza’ah and its surroundings. As a result, the medical crews were forced to vacate the hospital and center for some time, noting they are 800 meters away from the border fence. The press crews were directly targeted. As a result, journalist Mohammed Hasan Mohammed al-Sawalhi (40) was hit with a bullet to the right hand and his video camera with which he was covering the incidents in eastern Gaza was hit as well, noting that al-Sawalhi was wearing a blue PRESS-marked vest. The Israeli forces also targeted a car belonging to al-Manarah Press Office while many journalists suffered tear gas inhalation. PCHR’s investigations point out that the injury of 3 of those killed was directly to the head and neck while the fourth killed was wounded to the back in addition to the other injuries that were mainly in the head, neck, back, chest, abdomen and limbs. Moreover, there are 10 civilians in critical condition, portending that the death toll would rise in any moment. PCHR’s fieldworkers noticed that the Israeli shooting and teargasing at the protesters intensified randomly when some protestors managed to pull parts of the second barbed wires placed inside the Palestinian territories around 50 meters away from the main border fence. As a result, many of them were wounded particularly in eastern Rafah and Khuza’ah. According to medical sources in the Gaza Strip hospitals through dealing with the injuries, many of those hit with live bullets suffered large tissue lacerations and big holes in the injured part, indicating the bullets used by the Israeli forces are explosive live bullets. As part of targeting fishermen in the sea, the Israeli forces continued to escalate their attacks against fishermen in the Gaza Sea, indicating to the on-going Israeli policy of targeting their livelihoods. During the reporting period, PCHR’s fieldworkers monitored 11 shooting incidents; 6 in north-western Beit Lahia and 5 in Western Soudaniyah, west of Jabalia in the northern Gaza Strip. In the West Bank, on 19 April 2018, a Palestinian civilian (65) was wounded when Israeli forces raided his family house in al-Bustan neighbourhood in Silwan village, south of occupied East Jerusalem’s Old City, to arrest his son. They fired sound bombs and rubber bullets at the house door, wounding him with sound bomb shrapnel. On 22 April 2018, 4 demonstrators were wounded when Israeli forces raided the vicinity of al-Quds- Abu Dis University, east of occupied Jerusalem, and completely closed the area, declaring it a military zone to secure the maintenance works in the annexation wall adjacent to the university. Meanwhile, clashes erupted between dozens of Palestinian youngsters and Israeli forces who used live and rubber bullets to disperse the youngsters. As a result, 4 of them were wounded. On 23 April 2018, two Palestinians were wounded when Israeli forces moved into Halhoul, north of Hebron and dozens of youngsters protested against them and threw stones at the military vehicles. The Israeli forces in response fired rubber-coated metal bullets at the youngsters, wounding 2 of them. In addition to the abovementioned injuries, during the reporting period, 5 Palestinian civilians, including a child, were wounded after Israeli forces opened fire at them and fired tear gas canisters directly during peaceful protests and stone-throwing at the Israeli soldiers stationed at the entrances to the Palestinian communities in the West Bank. Those demonstrations came in the light of demonstrations organized by Palestinian civilians in protest at Trump’s decision to recognize Jerusalem as the capital of Israel, the Israeli forces’ ongoing settlement crimes, confiscation of Palestinian lands, and Israeli forces’ crimes against the peaceful demonstrations organized by the Palestinians along the eastern borders of the Gaza Strip. As part of the Israeli collective punishment policy against the Palestinian families of those accused of carrying out attacks against the Israeli soldiers and/or settlers, the Israeli forces blew up a house belonging to the family of prisoner Ahmed al-Qamba’a in the vicinity of al-Batikhah intersection in al-Basatin neighbourhood, north of Jenin. The 160-square-meter house sheltered a family of 6 members, including 2 children. It should be noted the mentioned family evacuated the house a month ago after the Israeli Supreme Court had reject fused the appeal the family filed to cancel the demolition decision. It should be mentioned that the Israeli forces arrested the abovementioned and accused him of being involved in the attack carried out by Ahmed Jarar on 09 January 2018, near Sorah village, southwest of Nablus that resulted in the killing of a Rabbi. As part of house demolitions and notices in favor of settlement expansion, on 23 April 2018, Israeli forces uprooted dozens of olive trees and leveled agricultural lands near Sour Baher village, south of East Jerusalem, to pave the way towards establishing new settlement units. Ahmed Nemer said that 56 dunums were leveled and 100 olive trees aged 70 years were uprooted in addition to stealing them after being uploaded on Israeli trucks. He added that the Israeli municipality decided in 2010 to build 166 house units on this land in cooperation with the Israeli Ministry of Housing and police for the interest of Israeli retired officers. However, the decision was challenged by the four families and the case is pending in the Israeli courts. On 24 April 2018, Israeli forces distributed dozens of demolition orders targeting residential facilities and building in Qalendia village, north of occupied East Jerusalem, under the pretext of building without a license. 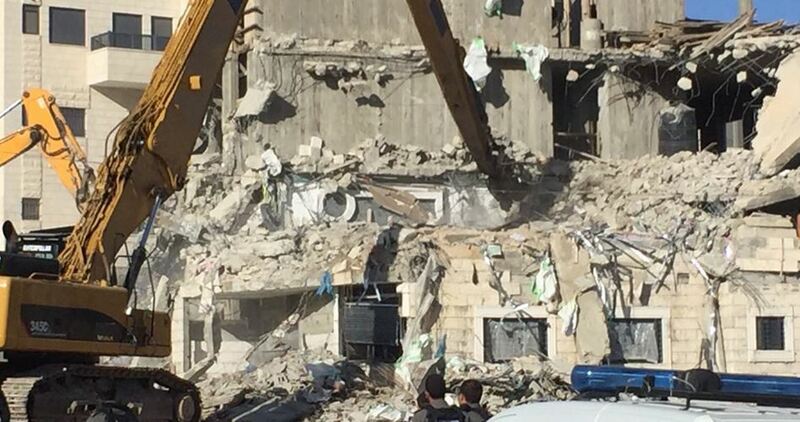 Journalist and activist Mahmoud ‘Awadallah said that the summonses and demolition order targeted 10 buildings, adding that all those building are inhabited and some of them were built 10 years ago. In another context, on 22 April 2018, the Israeli forces closed al-Safa al-Hadithah Printing House in Beit ‘Anan village, northwest of occupied East Jerusalem, after damaging its contents, destroying one of its walls and confiscating printers worth tens of shekels. The Israeli forces claimed the Printing House “supports terrorism”. However, Raja’ie Hmeid, the owner, said that the Israeli forces completely destroyed the printing house’s contents and confiscated a printer worth 120,000 shekels and a computer. He added that he has never printed anything for any Palestinian faction or any inciting materials, emphasizing that his printing house only prints advertising leaflets for stores. He also said that the printing house is the source of livelihood for him and his 11-member family; thus, he and his 5 sons who work with him have become jobless. As part of demolition of civilian objects, on 24 April 2018, the Israeli forces demolished and confiscated a residential tent in Rajm al-Harmah area in Kherbet Sousia, south of Yata, south of Hebron. They also confiscated a mobile house “caravan” in Irfa’aiyah area, eastof Yata, south of the city, under the pretext of being established in Area C according to the 1993 Oslo Accords without obtaining a license. On 25 April 2018, Israeli forces accompanied with 3 bulldozers moved into the western area of Bardala village in Northern Jordan Valley. The bulldozers uprooted 130 olive trees and confiscated them and cut 190 other trees in the same land in addition to spraying chemicals on its stumps to prevent their growth. The 10-dunum land belongs to Hussein Sawaftah and is planted with 1000 olive trees. As part of the Israeli settlers’ attacks against Palestinian civilians and property, on 19 April 2018, hundreds of armed settlers moved into Solomon’s Anicent Pools and a high mount overlooking Urtas village, south of Bethlehem, which are both areas classified as Areas A according to Oslo Accords. The settlers who were under the Israeli forces’ protection and accompanied with police dogs wandered the pools and scrublands and bathed in their springs, claiming it is a scared area for Jewish. On 20 March 2018, settlers from “Giv’at Asaf “ settlement moved into Barqa village, east of Ramallah and punctured the front and back wheels of 30 cars. On the same day, a group of settlers from “Yitsihar” settlement calling themselves the “Price Tag” groups established in the southern side of Burin village, south of Nablus, attacked a plot of land belonging to Mohammed Zeben. The settlers cut 100 olive trees aged between 60 and 70 years using hand and automatic saws. On the same day, a group of settlers from “Beit Hagai” settlement attacked a bus carrying students from al-Karmel School, east of Yata, with stones, wounding a 12-year-old student with a stone to the face and causing him a fracture in the nose. On 21 April 2018, a number of settlers attacked with stones a house belonging to the Qafishah family near al-Ibrahimi Mosque in Hebron’s Old City and called the residents with bad names, ordering them to leave the house. As a result, some windows in the ground floor were broken. On 25 April 2018, Price Tag Groups attacked Jaloud village, southeast of Nablus, and punctured tires of 3 cars. They also wrote slogans against Arabs and Muslims on the houses walls and cars before they left the village. As part of the collective punishment policy adopted by the Israeli forces against the Palestinian civilians accused of carrying out attacks against Israeli soldiers or/and settlers, Israeli forces blew up a house belonging to Ahmed Jamal Ahmed Mohammed al-Qamba’a in Jenin. According to PCHR’s investigations, at approximately 13:00 on Tuesday, 24 April 2018, Israeli forces accompanied with several military vehicles and a heavy bulldozer moved into Jenin and stationed in the vicinity of al-Batikhah intersection near North Gate Hotel in al-Basatin neighborhood, north of the city. They surrounded a house belonging to prisoner Ahmed al-Qamba’a. The soldiers raided and searched the house and the engineering unit began to plant explosives in the house walls. At approximately 05:10, they blew the house, which is comprised of one floor, established on an area of 160 square meters and inhabited by 8 individuals, including 2 children. Al-Qamba’a family evacuated the house a month ago after the Israeli Supreme Court rejected the appeal submitted by the family to stop the demolition order signed by the Israeli forces Commander in the West Bank. It should be noted that the Israeli forces arrested the abovementioned civilian and accused him of participating in the attack carried out by Ahmed Jarrar on 09 January 2018 near Surrah village, southwest of Nablus. The attack resulted in the death of a Rabbi. At approximately 16:30 on Thursday, 19 April 2018, Israeli forces stationed behind a sand barrier, 50 meters away from the eastern side of the border fence between the Gaza Strip and Israel, east of Abu Safiya Hill, northeast of Jabalia in the northern Gaza Strip, fired live and rubber bullets and tear gas canisters at dozens of Palestinian who were about 50 to 150 meters away from the western side of the abovementioned border fence. The protestors set fire to tires and threw stones at Israeli soldiers from far distances. The clashes continued until approximately 19:30 on the same day. As a result, 3 civilians were wounded. One of them was hit with a live bullet and the 2 others were hit with live bullet shrapnel. Doctors classified their injuries as moderate. At approximately 17:00 on the same Thursday, Israeli forces stationed behind the border fence between the Gaza Strip and Israel, north and northeast of the demonstration yard, east of Khuza’ah village, east of Khan Yunis in the southern Gaza Strip, fired live bullets and tear gas canisters at a group of protestors who were present in in the vicinity of the demonstration encampments. Some of the civilians attempted to approach the security fence. According to observations of PCHR’s fieldworkers, many tear gas canisters targeted the center of the camp where hundreds of civilians were present. As a result, dozens of civilians suffered tear gas inhalation. At approximately 07:00 on the same Friday, 20 April 2018, Israeli forces stationed behind the border fence between the Gaza Strip and Israel opened fire at a group of Palestinian young men who were in the northeast of the Great March of Return camp established by the Supreme National Authority for the Great March of Return and Breaking Siege, east of Khuza’ah village, east of Khan Yunis. As a result, a civilian was hit with a live bullet to the left knee and was transferred to Gaza European Hospital to receive medical treatment. Half an hour later, the Israeli warplanes dropped thousands of leaflets near the protest encampments, warning the residents of being targeted if approaching or attempting to damage the border fence. Over the morning hours, hundreds of civilians, including women and children within entire families started swarming to the camp, which is surrounded by the border fence from the north and east at distances averaged from 250-500 meters to participate in the “Martyrs and Prisoners’ Friday”. Following the Friday Prayer, at approximately 13:30, the number of participants in the five demonstrations increased, reaching to hundred thousands of men, elderlies, women and children. They deployed inside and outside the camps yards, raised flags, and chanted slogans and national songs , while dozens of them approached first security fence established inside the Palestinian lands, 70-50 meters away from the main border fence. observations by PCHR’s fieldworkers showed that the Israeli forces increased the height of the hills on which the Israeli snipers position so they would have a clear view of the area while dozens snipers continued to position behind the sand barriers, hills and military jeeps, 30-50 meters inside the border fence. The Israeli snipers deliberately and sporadically opened fire at the participants in the peaceful demonstrations which were as always fully peaceful, and PCHR’s fieldworkers did not witness weapons or armed persons even dressed in civilian clothes among the demonstrators, who were thousands of elderlies, women, children and entire families. Those demonstrators were raising flags, chanting slogans and national songs and flying kites in high numbers. The demonstrators also set fire to tires and burned the Israeli flags. The Israeli forces widely used bursts of tear gas canisters targeting the center of the demonstrations and beyond away from the demonstrators near the border fence. As a result, dozens of civilians suffered tear gas inhalation and seizures. They were transferred to hospitals. The Israeli forces fired tear gas canisters, which fell on the field hospital and medical center belonging to al-Barakah Algerian Association in Khuza’ah and its surroundings. As a result, the medical crews were forced to vacate the hospital and center for some time, noting they are 800 meters away from the border fence. PCHR’s fieldworkers noticed that the Israeli shooting and targeting at the protesters intensified randomly at approximately 17:00 in the evening when some protestors managed to pull parts of the second barbed wires placed inside the Palestinian territories around 50 meters away from the main border fence. The shooting sporadically and deliberately continued until approximately 20:00. As a result, Sa’ed ‘Abdel Majid ‘Abdel ‘Aal Abu Taha (31) from al-Qararah in Khan Yunis was hit with a bullet to the neck at approximately 18:00 when he was around 70-100 meters away from the border fence, east of Khuza’ah in Khan Yunis. Moreover, 67 civilians, including 7 children, 2 women, 2 journalists and 2 paramedics, were wounded. Thirty-nine of them were hit with live bullets, 27 were directly hit with tear gas canisters and one civilian was hit with a rubber bullet. The wounded civilians were transferred to field hospitals in the camp and then transferred to Gaza European and the Algerian Hospitals in the city. Doctors classified the injury of two civilians as serious. At approximately 08:00 on the same Friday, thousands of civilians, including women and children, within entire families started swarming to camps established by the Supreme National Authority for the Great March of Return and Breaking Siege, east of Malakah intersection, east of al-Zaitoun neighborhood, east of Gaza City. The activities included raising Palestinian flags, burning the Israeli flags, chanting slogans and national songs, setting fire and flying kites. Despite that the demonstration were clearly peaceful, the Israeli forces stationed behind the border fence between the Gaza Strip and Israel deliberately and sporadically fired live and rubber bullets and tear gas canisters at the protestors. As a result, 79 civilians, including 19 children and 4 women were wounded. Fifty-one of them were hit with live bullets, 4 were hit with rubber bullets and 24 were directly hit with tear gas canisters. They were transferred to al-Shifa and al-Quds Hospitals in Gaza City. Doctors classified the injury of 3 civilians as serious. Ahmed Nabil Mohammed Abu ‘Aqel (25) from Jabalia refugee camp was hit with a bullet to the head; part of which was crushed. Ahmed Rashah ‘Abdullah al-‘Athamnah (24) from Beit Hanoun was hit with a bullet to the back. Mohammed Ibrahim Ayoub Ayoub (14) from Jabalia refugee camp was hit with a bullet to the head. During the clashes, 48 civilians, including 9 children and a woman, were wounded. Thirty-three of them were hit with live bullets, one civilian was hit with a rubber bullet and 14 others were directly hit with a tear gas canister. They were transferred via ambulances belonging to Palestine Red Crescent Society (PRCS), Medical Services and Union of Health Work Committees and the Ministry of Health to the Indonesian, al-Awda and Kamal Edwan Hospitals. Doctors classified the injury of a civilian as serious. It should be noted that this is the fourth Friday for the Great March of Return was distinguished with the presence of a large number of families, which include women, children and elderlies, who were inside the camps that were moved 100 meters closer to the border fence. Therefore, the distance between the camps and the border fence were reduced from 700 meters into 600 meters. This Friday was also distinguished with folklore activities and photos exhibition relevant to the March of Return. Dozens of young men flew kites. At approximately 13:00 on the same Friday, thousands of protestors started swarming to camps established by the Supreme National Authority for the Great March of Return and Breaking Siege, 350 meters away from the border fence between the Gaza strip and Israel, east of al-Buraij in the central Gaza Strip. A few number of young men approached the border fence, set fire and threw stones at the Israeli soldiers stationed behind the border fence. The soldiers fired live bullets and tear gas canisters at the protestors. As a result, 46 civilians, including 7 children, were hit with live bullets. They were transferred via PRCS ambulances to al-Aqsa Hospital in Deir al-Balah. Doctors classified the injury of 2 civilians as serious and they were transferred to al-Shifa Hospital in Gaza City. At approximately 14:00 on the same Friday, thousands of civilians, including women and children, within entire families started swarming to camps established by the Supreme National Authority for the Great March of Return and Breaking Siege, east of al-Shawkah village, east of Rafah in the southern Gaza Strip. They raised the Palestinian flags and chanted slogans and national songs. Hundreds of young men approached the border fence, set fire to tires, flew kites and threw stones at the Israeli soldiers. The soldiers fired live bullets and tear gas canisters at them. The clashes continued until approximately 19:00 on the same day. As a result, 36 civilians, including 10 children, were hit with live bullets and its shrapnel and one civilian was directly hit with a tear gas canister. Moreover, dozens of civilians suffered tear gas canisters and seizures. The wounded civilians were taken to Field hospitals in the camp and then transferred to Abu Yusuf al-Najjar Hospital in Rafah and Gaza European Hospital in Khan Yunis. At approximately 23:30 on Sunday, 22 April 2018. Medical sources at Gaza European Hospital announced the death of Abdullah Mohammed Jebril al-Shamali (20) from al-Brazil neighborhood, south of Rafah succumbing to his previous wounds. Abdullah was hit with a live bullet to the abdomen and admitted to Abu Yusuf al-Najjar Hospital in Rafah. Due to his serious injury, Abdullah was transferred to Gaza European Hospital in Khan Yunis. The explosive live bullet caused him a sever bleeding and laceration to the lever and intestines. Abdullah received 96 blood units and underwent a surgery and then he stayed in the Intensive Care Unit (ICU) until his death was announced. At approximately 13:00 on Sunday, 22 April 2018, Israeli forces stationed behind the border fence between the Gaza Strip and Israel, north of Buret Abu Samrah, north of Beit Lahia in the northern Gaza Strip, opened fire at a group of civilians who approached the border fence. As a result, a civilian was hit with a live bullet to the left leg. He was transferred to the Indonesian Hospital and doctors classified his injury as moderate. At approximately 16:00 on the same Sunday, Israeli forces stationed behind the border fence between the Gaza Strip and Israel, north and northeast of the demonstration camp, east of Khuza’ah village, east of Khan Yunis in the southern Gaza Strip, sporadically fired live bullets and tear gas canisters at protestors who were present in the vicinity of the demonstration camp for 3 hours. Some of the protestors attempted to approach the border fence to throw stones at Israeli soldiers. As a result, 2 civilians were hit with live bullets to the lower limbs. They were transferred to Gaza European Hospital and doctors classified their injury as moderate. At approximately 16:30 on Monday, 23 April 2018, Israeli forces stationed behind the border fence with Israel, north and northeast of the demonstration camp, east of Khuza’aha village, east of Khan Yunis in the southern Gaza Strip, sporadically fired live bullets and tear gas canisters at a group pf protestors, who were in the vicinity of the camp for 3 hours. Some of them attempted to approach the border fence to throw stones at Israeli forces. As a result, a civilian was hit with a live bullet to the legs, causing their fracture and sever wounds to them. He was transferred to Gaza European Hospital and doctors classified his injury as moderate. At approximately 17:00 on Tuesday, 24 April 2018, Israeli forces stationed behind the border fence between the Gaza Strip and Israel, north and north east of the demonstration camp, east of Khuza’ah village, east of Khan Yunis in the southern Gaza Strip, sporadically fired live bullets and tear gas canisters for 2 hours at a group of protestors who were in the vicinity of the border fence to throw stones at Israeli forces. As a result, 2 civilians were hit with live bullets to the lower limbs. They were transferred to Gaza European Hospital and doctors classified their injury as moderate. At approximately 17:30 on Tuesday, 24 April 2018, Israeli forces stationed behind a sand barrier, 50 meters into the east of the border fence between the Gaza Strip and Israel, east of Abu Safiyah Hill, northeast of Jabalia in the northern Gaza Strip, fired live and rubber bullets and tear gas canisters at dozens of civilians who were about 50- 150 meters into the west of the border fence. Those civilians set fire to tires and threw stones at Israeli soldiers from far distances. The clashes resulted in the injury of 2 civilians with live bullets to the lower limbs. At approximately 08:00 on Monday, 23 April 2018, medical sources at Gaza European Hospital announced the death of Tahreer Mahmoud Sa’ed Wahbah (18) who is deaf from Ma’an in Khan Yunis succumbing to his serious wounds. According to PCHR’s investigations, at approximately 15:00 on Sunday, 01 April 2018, a number of Palestinian young men and children gathered about 200-250 meters away from the border fence between the Gaza Strip and Israel, north of the demonstration camp established into the east of Khuza’ah village, east of Khan Yunis. Some of them attempted to approach the border fence to set fire to tires and throw stones at Israeli forces stationed behind sand barriers, 30 meters behind the border fence. The soldiers sporadically fired live bullets at the protestors. At approximately 15:23, the shooting resulted in the injury of a civilian after being hit with a live bullet to the head, and part of his brain came out. Tahreer stayed at the ICU until his death was announced on Monday morning. At approximately 15:30 on Wednesday, 25 April 2018, medical sources announced the death of journalist Ahmed Mohammed Ashraf Hasan Abu Husein (24), from Jabalia refugee camp, north of the Gaza Strip, succumbing to wounds he sustained while covering the Great March of Return events on 13 April 2018, northeast of the abovementioned village. According to PCHR’s investigations, on Friday, 13 April 2018, Abu Husein was hit with a live bullet under the left underarm ” the left waist”, causing a laceration in most of the organs in the abdomen area. Abu Husein was covering the incidents of the Third Friday of the Great March of Return and Breaking Siege as he was wearing a Press-marked vest and helmet with clear TV mark. He was transferred to the Indonesian Hospital where he immediately underwent a surgery. A doctor, who supervised the surgery said to PCHR’s fieldworker that the doctors had to remove the left kidney and left lung and part of the spleen and intestines due to their laceration. Abu Husein then stayed in the ICU at Tel Hashomer Hospital in Israel Hospital. After a high-level government’s intervention, Abu Husein’s family was received a permit from the Israeli side to refer him to refer to Palestine Medical Complex in Ramallah to receive medical treatment on 15 April 2018. Abu Husein stayed at Palestine Medical Complex in Ramallah until his health condition was worse. He was then transferred to Hospital in Israel and stayed there until his death was announced. It should be noted that Abu Husein worked as a photojournalist at Bisan News, a reporter at Sawt El Shaab Radio Station and member of the Democratic Press Assembly. Following the Friday prayer 20 April 2018, dozens of Palestinian children and young men gathered at the northern entrance to al-Birah. They set fire to tire ad threw stones and empty bottles at Israeli soldiers stationed at “al-Mahkamah” checkpoint near “Beit Eil” settlement, north of the city. The Israeli soldiers fired live and rubber bullets, sound bombs and tear gas canisters at the protestors. As a result, 3 civilians, including a child, were hit with rubber bullets to the lower limbs. The wounded civilians were transferred via a PRCS ambulance to Palestine Medical Complex in Ramallah to receive medical treatment. Following the Friday prayer on the same Friday, dozens of Palestinian protestors gathered at the entrance to al-Laban eastern village, branching form Ramallah-Nablus Street, south of Nablus. They set fire to tires and threw stones at Israeli soldiers who arrived at the area and stationed behind sand barriers. The soldiers fired live and tear gas canisters at them. As a result, a 22-year-old civilian was hit with a live bullet to the left foot. He was transferred to Yasser Arafat Hospital in Salfit to receive medical treatment. At approximately 15:20 on the same Friday, a group of Palestinian protestors gathered in the center of Qalqiliyah into the southern entrance to the city. They chanted national slogans calling for ending occupation and condemning the U.S. President Donald Trump’s decision to recognize Jerusalem as the capital of Israel and condemning the Israeli forces’ crimes against Palestinian protestors at the eastern borders of the Gaza Strip within the Great March of Return and Breaking the Siege activities. The Israeli forces fired rubber bullets, sound bombs and tear gas canisters at the protestors, but no casualties were reported. They also arrested Abed Ahmed Sharim al-Tamali (17). At approximately 17:20 on Saturday, 21 April 2018, a group of Palestinian civilians moved from Kufor Qaddoum village, northeast of Qalqiliyah into the eastern entrance to the village, which has been closed for 15 years in favor of the entrance to “Kedumim” settlement established on the village lands. The protestors chanted national slogans demanding to end occupation, condemning the U.S President Donald Trump’s decision to recognize Jerusalem as the capital Israel and condemning the Israeli forces’ crimes against Palestinian protestors at the eastern border of the Gaza Strip within “The Great March of Return and Breaking the Siege” activities. The protestors set fire to tires and threw stones at Israeli soldiers stationed behind sand barriers. The soldiers fired rubber bullets, sound bombs and tear gas canisters at them. As a result, a 37-year-old civilian was hit with a rubber bullet to the right foot. The Israeli forces also opened fire at a car driven by Bashar Shtaiwi from the back causing a great damage to the external body. On Monday, 23 April 2018, Israeli vehicles cut dozens of olive trees and leveled a plot of land near Surbaher village, south of occupied East Jerusalem as a prelude to confiscate it and establish a new settlement unit on it. Ahmed Nimer said that the Israeli forces completed their measures to take over the plot of land confiscated in 1972 by the Military Governor. The plot of land is of an area of 56 dunums located in an area near Surbaher village. He said that the land belongs to 4 Palestinian families identified as Nimer, Dowwyat, ‘Awwad, and Fawaqah. The abovementioned land is planted with olive trees and contains 2 facilities, which are a grave and house built over 70 years ago. He added that those families filed cases to the Israeli Courts when the plot of land was confiscated in 1972 and continued until 1984 when Israeli Courts decided to freeze any confiscation measures and allow the land owners to use it as an agricultural land. He pointed out that the Israeli Municipality in Jerusalem decided in 2010 to build 166 house units on this land, in cooperation with the Israeli Ministry of Housing and the Israeli Police , in favor of retired Israeli officers. The decision was challenged by the four families and the case is pending in Israeli Courts. Nimer added that: “The Jerusalem District Court issued a decision a month ago allowing the Ministry of Housing in Jerusalem to start the construction works in the land and allowing us to continue our case.”. He also asked: “How can you start implementing and confiscating, and at the same time allow us to complete the complaint. He added that families were given 30 days to vacate the land and uproot the olive trees, but they refused. They were then surprised with an officer from the court ,who told them that there was a decision to start leveling the land. Nimer confirmed that around 56 dunums were leveled and 100 olive trees planted 70 years ago were uprooted and stolen by the Israeli forces. On Tuesday, 24 April 2018, Israeli forces distributed dozens of demolition orders targeting facilities and buildings in Qalandia village, north of occupied East Jerusalem, under the pretext of non- licensing. Mahmoud ‘Awad Allah, Journalist and Activist, said that crews of the Israeli Building Control Unit accompanied with military patrols moved into the village and conducted a geographical survey of facilities and buildings there. He added that many civilians were noticed to self-demolish their facilities or the Israeli vehicle will demolish the facilities and they will pay the demolition costs. He pointed out that the Israeli forces handed some residents summonses to question them about building facilities without license. He clarified that the Israeli forces handed summonses and demolition notices to around 10 buildings. ‘Awad Allah confirmed that all these buildings are inhabited and some of them were built 10 years ago. At approximately 09:00 on Tuesday, 24 March 2018, Israeli forces accompanied with 2 military vehicles, a vehicle of the Israeli Civil Administration , and a mounted-crane truck moved into Rajm al-Hamra area in Kherbit Sosiyia, south of Yatta, south of Hebron. The Israeli forces destroyed a residential tent belonging to Khadir Nawaj’ah, under the pretext of establising the tent in Area C without getting a license. At approximately 10:00 on Tuesday, Israeli forces accompanied with 2 military vehicles, a vehicle of the Israeli Civil Administration , and a mounted-crane truck moved into Irfa’iyia area, east of Yatta, south of Hebron. They confiscated a mobile house (caravan) belonging to Taleb Shehda al-Jundi, under the pretext of putting it in Area C without getting a prior license. At approximately 06:00 on Wednesday, 25 April 2018, Israeli forces accompanied with Israeli Liaison officers and 3 bulldozers moved into the western area of Bardlah village in northern Jordan Valley, east of Tubas. The bulldozers cut 130 olive trees and confiscated them. They also cut 190 other trees and sprayed chemicals on its stumps preventing their growth. The plot of land belongs to Hussain Nimer Sawaftah and are planted with 1000 olive trees. At approximately 10:00 on Monday, 23 April 2018, Israeli forces accompanied with military vehicles and a vehicle of the Israeli Civil Administration moved into Kherbit Ghoween, south of Samou’a village, south of Hebron. The Israeli Civil Administration officers handed 9 civilians notices to demolish their residential buildings under the pretext of building their houses in archaeological area. The officers gave the houses’ residents 14 days to leave. Kherbit Ghoween is located south of Samou’a village and shelters around 14 families, including 120 members. Kherbit Ghoween is connected with Samou’a village via a dirt road and there is no service institutions in it. Moreover, its inhabitants rely on breeding livestock and planting their lands. Kherbit Ghoween is near “Shani Laffni” settlement from the western side, near al-Kharabah area from the eastern side, near the bypass road of Samou’a village from the northern side, and near the annexation wall from the southern side. At approximately 13:00 on Wednesday, 25 April 2018, Israeli forces accompanied with military vehicles and a vehicle of the Israeli Civil Administration moved into Wad al-Shaiekh area adjacent to Bypass Road (60), east of Beit Ummer village, north of Hebron. The Israeli Civil Administration officers handed Basem Khadir ‘Abed al-Muhasin al-‘Alami a notice to stop construction works in his old house under the pretext of non-licensing. After that, the Israeli officers headed to Beit Za’tah area in the village and confiscated 2 trucks, one of them is a digger. The two trucks were in a plot of land belonging to Na’iem Ihmidan Abu Mariyiah, digging a well in his land. The two trucks were taken to “Gosh Etzion” settlement, south of Bethlehem. On Thursday, 19 April 2018, around 100 Israeli armed settlers moved into Solomon’s Archaeological Pools and a hill overlooking Urtas village, south of Bethlehem, under the Israeli forces’ protection and accompanied with police dogs. The abovementioned areas are classified as Area A, according to Oslo Accords. The Israeli settlers wandered in the pools claiming that it is a sacred area for the Jews and was mentioned in the Torah – according to their claim. Ahmed Salah, Coordinator of the Committee Against the Wall and Settlements in al-Khader village, said that ages of the settlers, who raided the area, ranged between 16-17 years old. He said that the Israeli authorities brought those youngsters to this area to incite them to the fact that this area is for the Jews and must be preserved. Salah said this was the fourth time that settlers has moved into the area since the beginning of April, which is a clear indication of the escalation. It should be noted that the Israeli settlers raid Solomon’s Pools from time to time under the Israeli forces’ protection. At approximately 02:45 on Friday, 20 April 2018, a group of Israeli settlers from “Givat Atzaff “ settlement in Burqa village, east of Ramallah. The settlers punctured the tiers of around 30 vehicles with sharp tools. On Friday, a group of Israeli settlers from “Yitzhar “ settlement established in Bureen village’s lands, south of Nablus, attacked a plot of land belonging to Majd Rajaa Mohamed Zain. The plot of land is located in al-‘Amarah area “Karm al-Sawanah”, classified as Area C, according to Oslo Agreement. The Israeli settler cut 100 olive trees planted 60 to 70 years ago. The plot of lands has an area of 8 dunums planted with 110 olive trees. The Israeli Liaison and Police arrived at the area and took photos of the attacked trees. At approximately 20:00 on Friday, a group of Israeli settlers from “Beit Hagai” settlement attacked with stones a bus carrying students from al-Karmel School, east of Yatta, south of Hebron. As a result, the bus windows were broken and a student Ahmed Mohamed Ahmed No’man (12) was hit with a stone to the face, so he sustained a fracture to the nose and was taken to Hebron Governmental Hospital, where he underwent a surgery. At approximately 14:00 on Saturday, 21 April 2018, a group of Israeli settlers attacked a house belonging to Qafishah Family near al-Ibrahimi Mosque in Hebron’s Old City, with stones. The settlers cursed the house residents and ordered them to leave the house. As a result, the house windows on the ground floor were broken. A number of Israeli settlers gathered in al-Za’tari Family house, which they seized few months ago. Fawzi Sami Farhan ‘Abas, 3 tires punctured. Mohamed Kamal Farhan ‘Abas, 3 tires punctured. Mohamed Kamal Farhan ‘Abas, , 4 tires punctured. Riyad Ahmed Abed al-Hadi Hamoud, slogans written on his vehicle. Fully detailed document available at the official website for the Palestinian Center for Human Rights (PCHR).